I was trying to watch recorded HD content from my HTPC on my laptop, but it would stutter and be unwatchable. I quickly realised that my wireless network was too slow. So to diagnose the problem I tried copying a large (2 Gb) file across my wireless network and see what sort of speeds I was getting. Only around 700Kb/second! Hmm, that seems awfully slow. I opened up my router’s config page (Linksys WRT54GL using the patched tomato firmware) and tried the usual suspects – 1. changing to a different channel; 2. moving the router away from possible sources of interference; 3. trying a USB wireless network adaptor I had lying around instead of my laptop’s built in wireless, all to no avail. I was still only getting around 700Kb/sec. 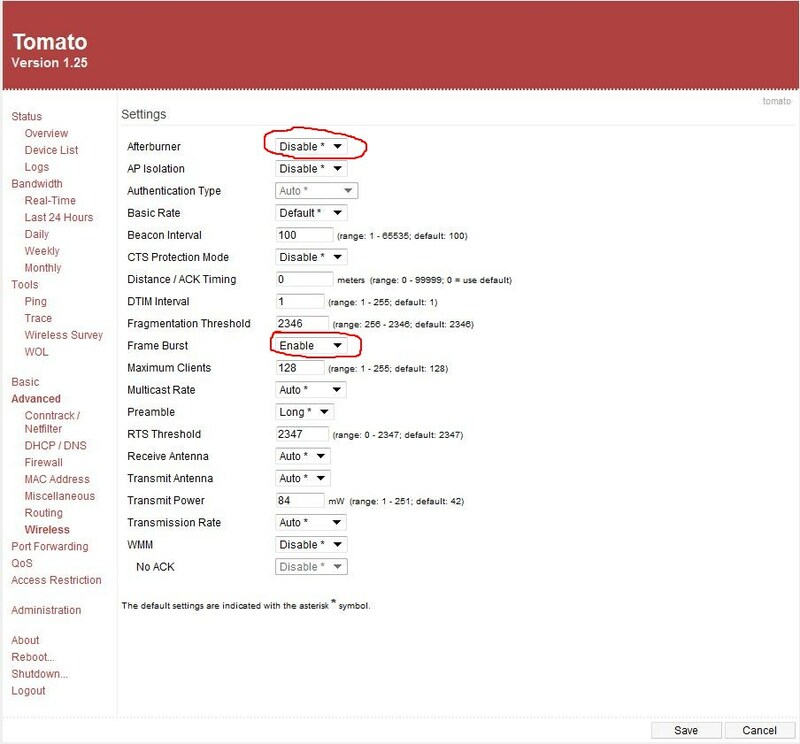 I went into the router’s Advanced settings page and had a look at the options in there. Hmm, let’s try disabling this Afterburner setting. Boom! Once that was disabled the file copy went up to 2Mb/sec. That setting is disabled by default, but I had enabled it when I first setup my router (a year ago) thinking it would probably make things faster. Well that wasn’t the case, it was slowing things down. I then tinkered with a few other settings, and I found that enabling Frame Burst sped things up a little bit, to around 2.5Mb/sec. Moral of the story, which applies to all technology really – stick with the default settings to begin with, and once you know your baseline then tinker.